In addition to the daily activities arranged by the staff of Tithebarn for the residents, the Friends of Tithebarn also organise various other events and trips out. 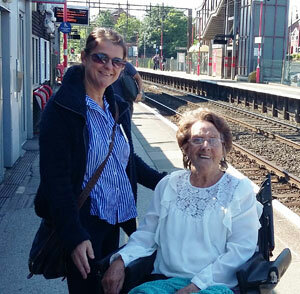 Amber Chislett (left) and Pat Anderson waiting for the London train at Runcorn Station. Two such trips have been a trip to United Grand Lodge in Queen Street, London and a trip to Liverpool to see the Terracotta Warriors. There is also a trip planned to Llandudno, traveling for morning coffee and a variety show. A small party left Tithebarn and headed to Runcorn railway station to meet the London train to take the residents to London to visit the Masonic Hall in Queen Street. The trip was arranged by the Chairman of the Friends of Tithebarn John Stallard. Upon arriving at Queen Street, the Tithebarn party were taken to the Masonic Museum and Library. Amongst the museum of ancient artefacts exhibits the residents enjoyed was the enormous gilded throne commissioned in 1791 for the Prince of Wales (later King George lV). After exploring the museum and library, Mary Piert and Amber Chislett went down to the basement to meet staff of the RMBI. The party then left the Masonic Hall for lunch and drinks at the Prince of Wales public house in Drury Lane. Refreshed and fed they headed back to Euston Station by taxis to catch the train back to Runcorn, where they were then driven back to Tithebarn. 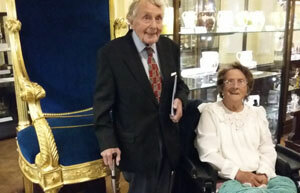 Resident Pat Anderson thoroughly enjoyed the museum and the outing also brought back happy memories. Pat is a Grand Officer in the Order of Women Freemasons and often travelled to London to attend lodge meetings held across the road from Great Queen Street Freemasons Hall. Jo Griffin and Pat Anderson beside the throne made for Prince of Wales, (later King George IV). The Liverpool trip came about from a ‘Dreams can come true’ initiative the Friends of Tithebarn have introduced for the residents of Tithebarn. The residents can post a dream they wish to complete into a bowl that sits under a hat by the entrance of the Tithebarn. The reason for the hat will be disclosed later. First to be honoured with his dream request was a Mason, George Lucy whose dream was to visit the exhibition of the Terracotta Warriors at the Liverpool Museum. The Friends of Tithebarn then went ahead and organised a visit for George and other residents to the exhibition. George, accompanied by other residents were driven to the Liverpool Museum. George found the exhibition both fascinating and moving. Liverpool was quite privileged to have the prestigious exhibition, with many pieces on show for the first time in Britain. One of the reasons that Liverpool became hosts was due to Liverpool having the oldest Chinese community in Europe. After viewing the Terracotta Warriors, the residents were treated to ice creams. When returning to Tithebarn, Mary Piert attached a feather to the brim of the hat that sits on the bowl. For every dream that is accomplished a feather will be added to the hat. Let’s hope this will be the first of many. Terracotta warriors and horses on show at the Liverpool Museum.